The Eureka KS tornado, June 26 2018: A "surprise" of sorts. 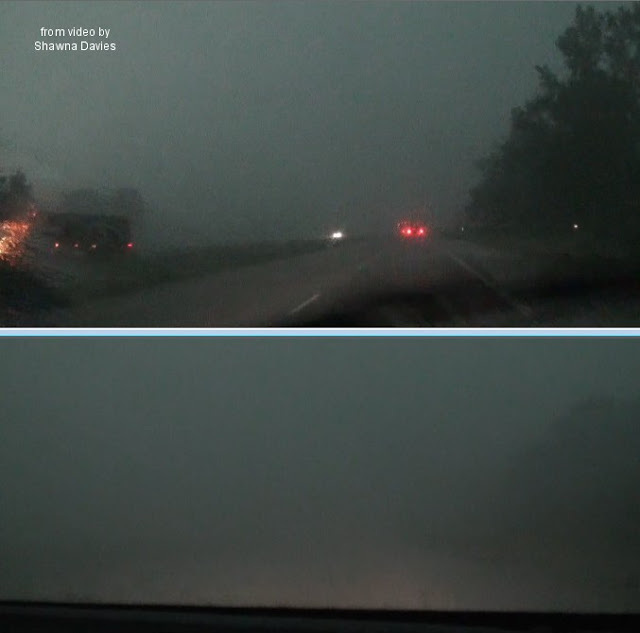 The tornado that struck Eureka, Kansas on Tuesday evening (see video image above) occurred without a watch, and though the storm was tornado-warned, it was with little or no lead time. Unfortunately, 8 people were injured, and this event was something of a "surprise." Severe weather forecasting often gets more difficult as summer moves in because weather systems and their ingredients are more subtle, and the atmosphere is already unstable across much of the U.S. In that context, this post is a brief analysis suggesting some ingredients that appeared to contribute to the tornado. 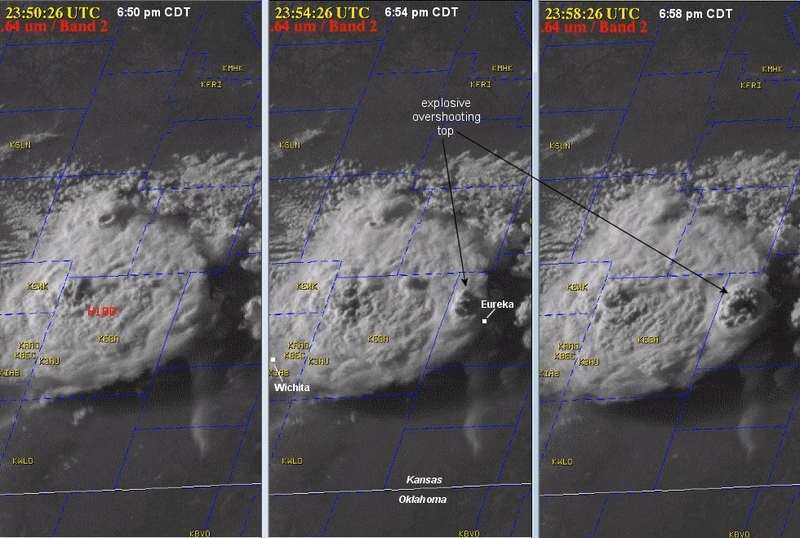 On the images above, a severe storm in progress was just northeast of Wichita, Kansas, but the developing Eureka storm could be seen (barely) on the last image at the east edge of the anvil of the ongoing storm farther west (see black arrow on 2nd image above). Notice that the Eureka storm's location appeared to be essentially right on the aforementioned outflow boundary, compared to the storm closer to Wichita. The tornado formed about 7:18 pm CDT, and was photographed from the nearby countryside by local resident Gary Williams as it moved east (see image at the top of this post, as well as the two below). 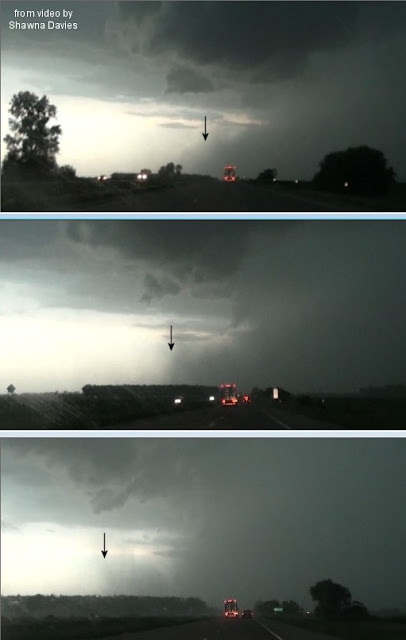 The mesocyclone became wrapped in rain (see 2nd image below), which may have hidden the tornado, and could explain why more photos of the tornado haven't materialized. Going back to the earlier surface map and 2-panel low-res satellite image near the beginning of this post, it appears that the Eureka storm developed right on the trailing outflow boundary from the storms earlier in the day. A common theme with my occasional blog posts this year has been that tornadoes tend to be associated with boundaries in unstable settings where wind shear, along with other ingredients supportive of tornadoes, tend to be maximized. Notice that the low-level wind shear (SRH) was maximized along the outflow boundary over southeast Kansas, and that there was some CAPE below 3 km on the west side of the outflow boundary near the developing tornadic storm. 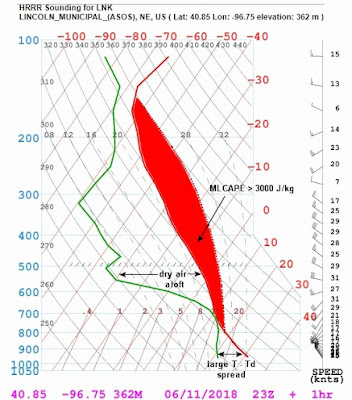 This suggests an unstable surface-based environment near the Eureka storm, also important (in addition to wind shear) for supporting significant tornadoes. The resulting energy-helicity index in the 3rd panel above was also maximized near and west of the boundary near the Eureka storm, suggesting support for supercell tornadoes. It is impossible to say exactly why the Eureka storm was tornadic, and why the others were not (a very brief rope tornado did occur northwest of El Dorado, Kansas around 5:30 pm CDT). But the presence of the trailing outflow boundary matches well with the location of the Eureka storm, and that certainly could have had some influence on that storm producing a significant tornado. This was on the back side of a closed upper low over Wisconsin (this same low helped to produce other tornadoes in southern Wisconsin and northern Illinois on June 26). 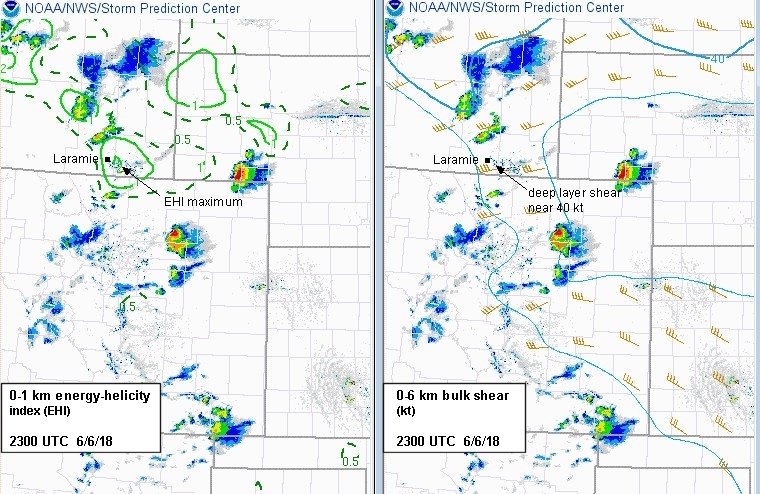 The shortwave disturbance helped provide lift for generating the evening thunderstorms in the unstable air over the southeast quarter of Kansas, and the stronger winds aloft associated with this disturbance (around 40 kts) also helped to support supercell storms in this setting. 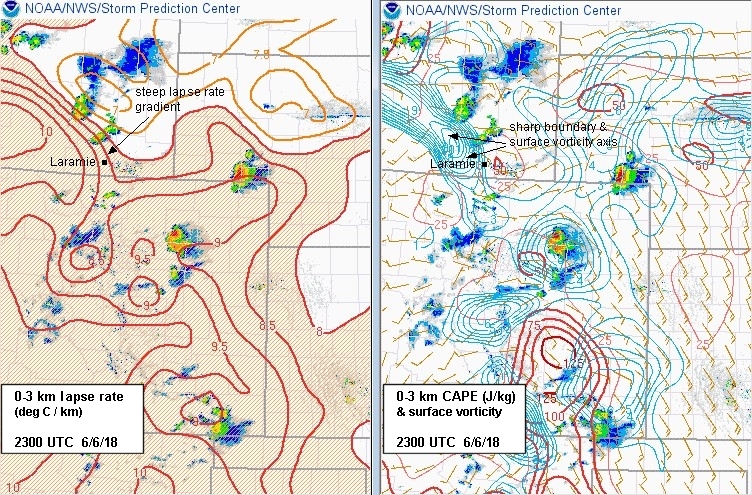 So, while the tornado potential over southeast Kansas was not easy to forecast on June 26, 2018, a careful analysis of ingredients and features in the 1-2 hours before the Eureka event shows several factors coming together that might support a significant tornado or two. This was particularly true along the outflow boundary where the Eureka storm developed explosively. An interesting fact: Eureka was hit by another EF3 tornado just 2 years ago, in July 2016 ! Last week, on Monday, June 11, my wife Shawna and I were able to get away from family health and caregiving issues in Kansas City for an afternoon in eastern Nebraska, our first chase since May 1. We saw what appeared to be a brief tornado northwest of Omaha, but more importantly, we witnessed a damaging downburst (see diagram and image above) crossing into southwest Iowa north of Nebraska City. It's been an extremely busy week, so I'm just now getting around to doing a post about this interesting event. We were heading south on I-29 around 7:00 pm CDT (0000 UTC) to get back to Kansas City, thinking we could outrun a supercell and developing squall line on the west side of the Missouri River. As we drove south, we were surprised to see the storms rapidly and unexpectedly bow swiftly eastward, crossing I-29 in our path with winds in the 80-90 mph range (an 88 mph gust was recorded near Thurman, Iowa). This wet bowing downburst felt very much like being in the eyewall of a hurricane, and several semi tractor-trailers were overturned on I-29. Damage to trees, roofs, and buildings was also reported from near Union, Nebraska, to Thurman and Sydney, Iowa. 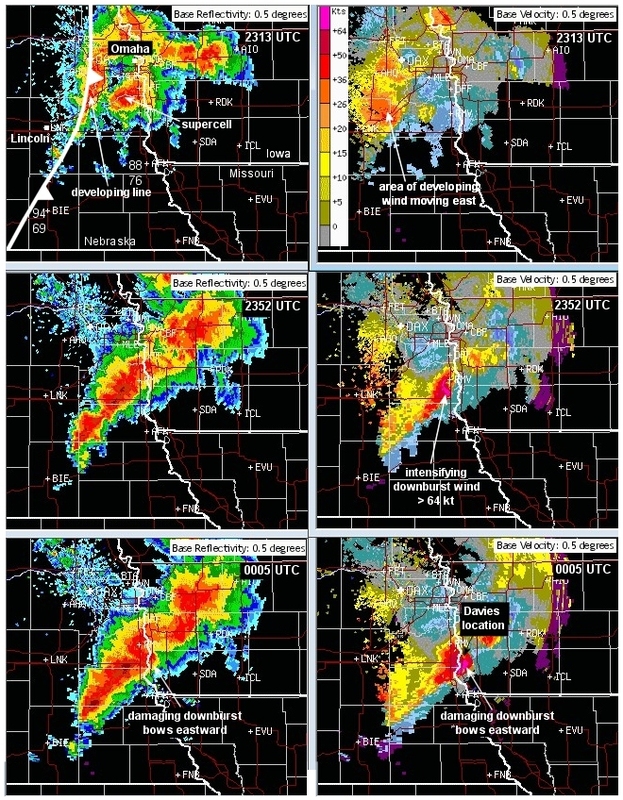 These images were at roughly 10 second intervals during a 30 second period just after 7 pm CDT (0000 UTC), and the arrows mark the leading edge of the precipitation-laden downburst, showing just how fast it was moving and accelerating! In pouring rain and strong winds, Shawna jumped out to see if the driver was all right. Anyone who is acquainted with my wife knows that she has a passion for helping out and knowing what to do after destructive weather and before first responders arrive. A level-headed Quik Trip truck driver also stopped beside us, and helped pull the semi driver out of his cab. Shawna brought him over to our vehicle, where we could see a sizable gash on his arm and some cuts to his face from falling when his semi flipped over in the 80+ mph downburst winds. We dug out towels to wrap his arm, called 911, and waited for help. After a bit, a state trooper began directing traffic along the narrow side shoulder to squeeze past the blocking semi, and told us to go to the next exit to wait for an ambulance. To save time, we decided to drive on down to Nebraska City, where Shawna took the injured driver into a hospital emergency room. Thankfully, his injuries weren't life-threatening, and we resumed our journey home, wishing him the best after he called his wife. Evaporation from rain falling through such dry layers can cool already precipitation-laden air even more to generate strong negative buoyancy and accelerate winds downward and forward to create a downburst. 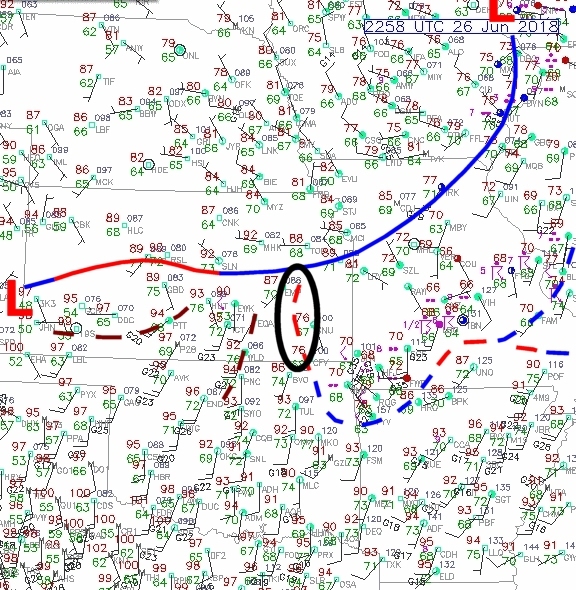 This line began to show an area of stronger low-level winds (go back to the radar images above at 6:52 pm CDT / 2352 UTC and 7:05 pm CDT / 0005 UTC), overtaking the supercell that had earlier produced some brief weak tornadoes south of Omaha, near Louisville, Nebraska. This area then bowed very fast across the Missouri River to intercept our path as the corridor of strong downburst winds accelerated eastward. This possible tornado was from a tornado-warned supercell near the intersection of the cool front and a residual outflow boundary from convection earlier in the day. 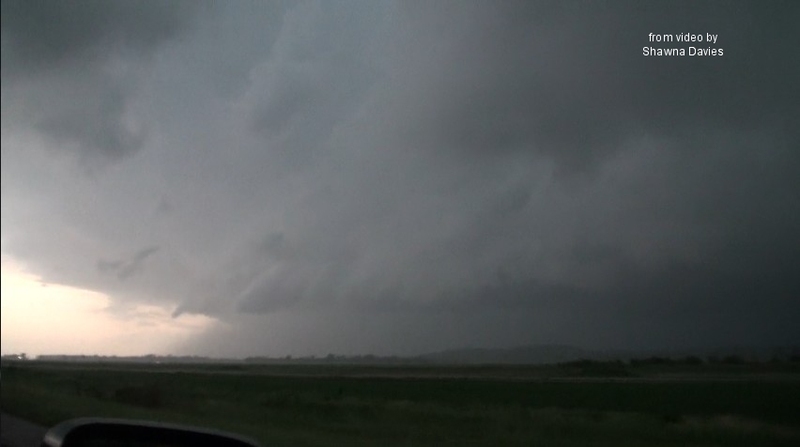 So, Monday, June 11 made for an unexpectedly interesting storm chase. It sounds like there were no critical injuries (including the driver we took to the hospital), so we are very grateful! 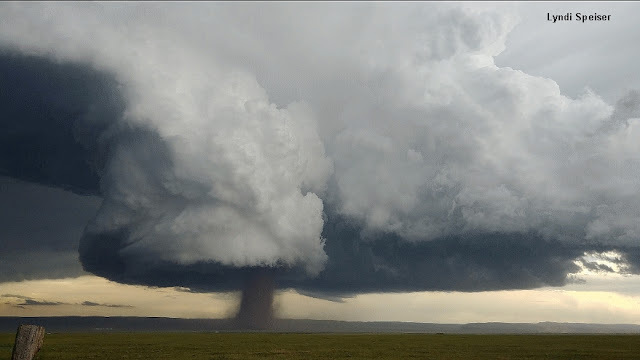 It's been an active two weeks regarding tornadoes in Wyoming! First, several tornadoes, including a large EF2, occurred northwest of Cheyenne on May 27. 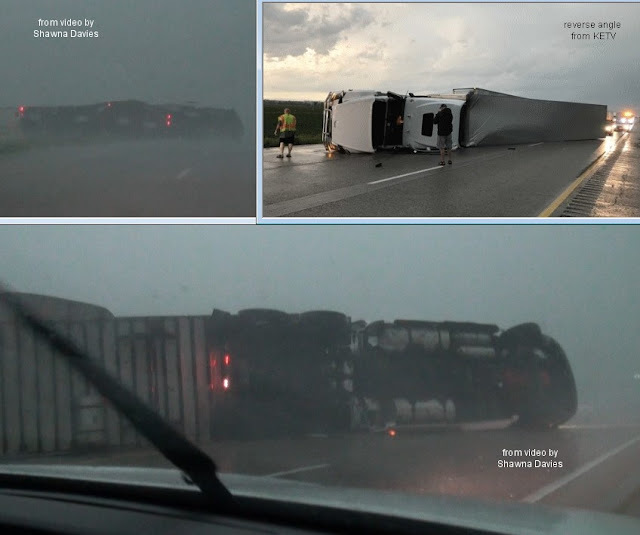 Then an EF3 tornado injured a couple people near Gillette on June 1, the first EF3-rated tornado in Wyoming in over 30 years. 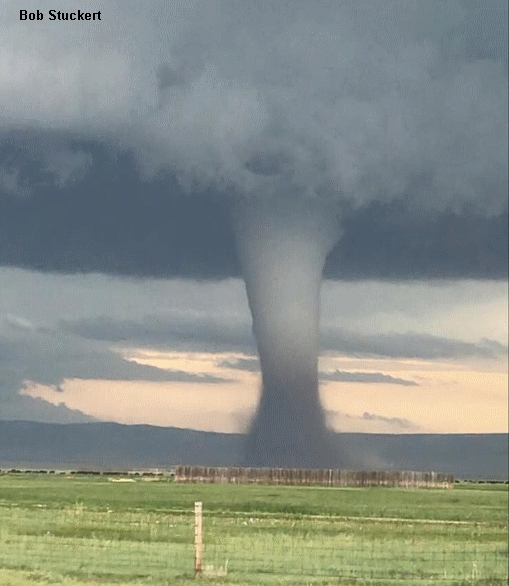 And yesterday (June 6, 2018) produced yet another EF3 tornado north of Laramie that was very photogenic and on the ground for around 50 minutes over mainly open country. It's interesting that the environment supporting this long-lived and highly visible tornado was not much evident, even shortly before the tornado. As a result, it was very difficult to forecast (for example, a 2% or less tornado probability on 6/6/18 SPC outlooks), making it a tornado case intriguing to examine regarding the contributing ingredients and setting. 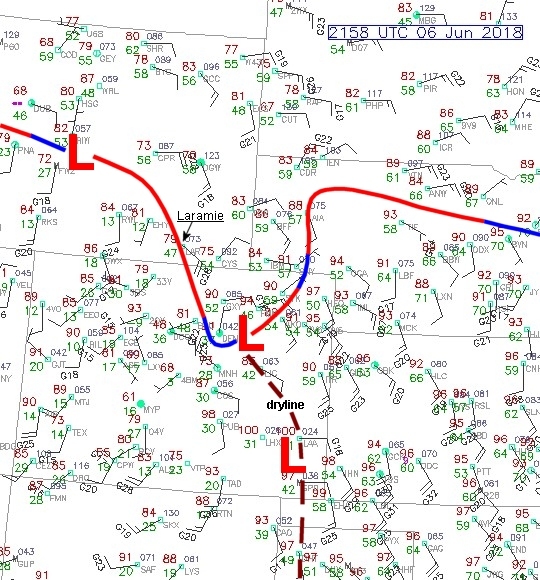 Notice that the Wyoming portion of this front was located near Laramie, and acted much like a dryline. Warm, dry air was southwest of the front (surface dew points in the teens deg F), while relatively moist upslope air was in place northeast of the front where dew points were in the upper 40s and low 50s (deg F) near and east of Laramie on southeastly winds. 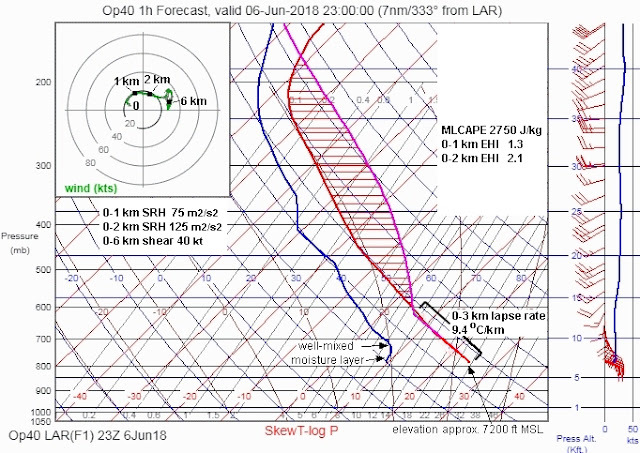 But with the sizable CAPE and no significant convective inhibition (CIN), and a very steep lapse rate/change in temperature (> 9.0 deg C/km) in the lowest 2 or 3 km, the stage appeared to be set for rapid upward parcel accelerations just above ground. This would be particularly true given the high surface elevation (above 7000 ft MSL), and the mixed-layer moisture depth in the lowest 1 km, which would help reduce dry air entrainment and CAPE dilution as storm updraft parcels accelerated upward from near the ground. 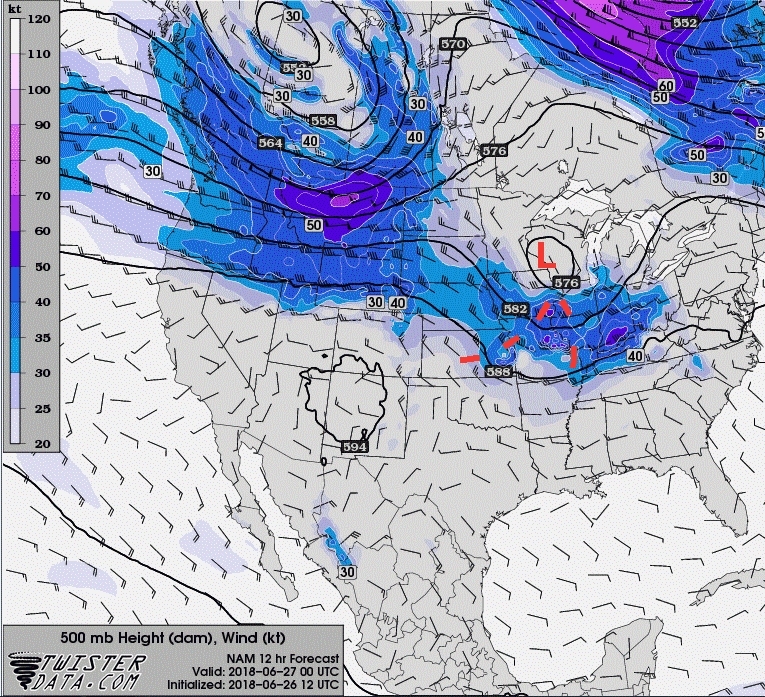 This convolution of localized ingredients suggests why this tornadic setting was so difficult to forecast in advance. 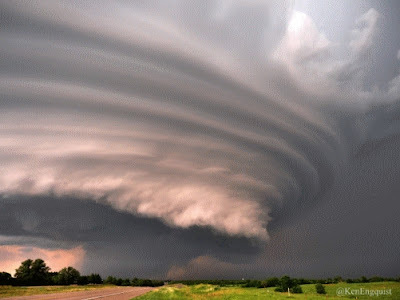 Most tornado settings that involve non-supercell processes are, by their very localized nature, essentially impossible to forecast, although an astute meteorologist may notice some of the ingredients coming together a short time before such an event. A very interesting case to study! A note: I haven't done any storm chasing or posted any blog cases in the past month, as my wife's mother has been in and out of hospitals and rehabs, and we're trying now to get her settled into a nursing home. Family first. 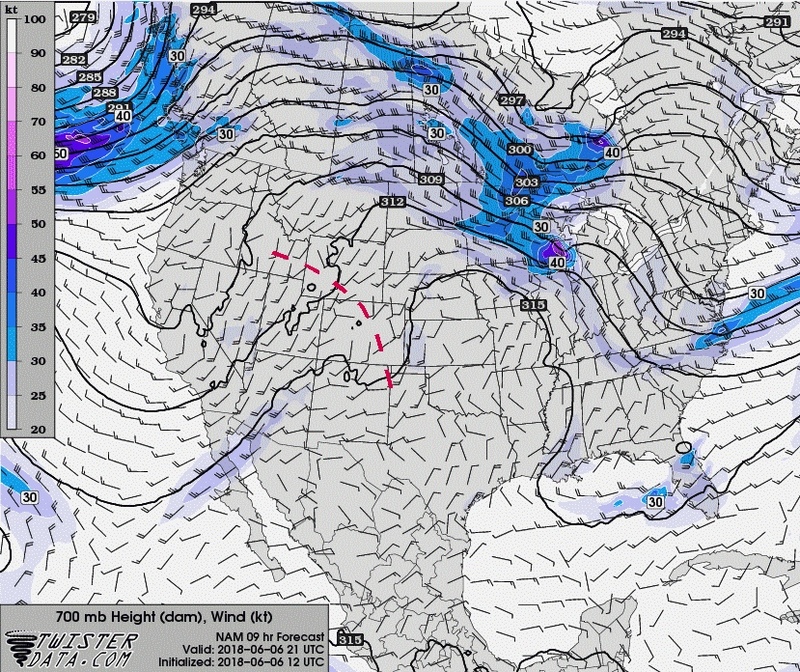 But I'll keep an eye out for interesting severe weather cases to blog about as time allows.